The INFRALERT consortium brings together 7 partners from 6 different EU-countries: Germany, Spain, Italy, Hungary, Sweden and Portugal. They cover the whole R&D cycle and will foster the project results to the market by different means. Interdisciplinary research and development is targeted at the field of telematics, transport ecology, transport economics, and transport planning. The group Operations Research at Fraunhofer IVI works on the development of decision support systems for logistics planning. The main field of application lies in transportation planning tasks for scenarios under uncertainties, i.e. for optimisation problems where one has to cope with dynamically changing situations and conditions. The group develops mathematical models, designs optimisation algorithms, and implements software systems for these kinds of problems. Ongoing research is done in the field of the planning of maintenance operations in railway infrastructure systems. This topic has been dealt with e.g. in the FP7 project ACEM-Rail, where the group was leading the Work Package on Maintenance Planning and Optimisation. Role in the project: FRAUNHOFER IVI is the Coordinator of the project and the leader of WP6 on ‘Smart Operation and Maintenance Decision Support’ and on WP10 on ‘Project Management’. CEMOSA is a Spanish engineering and quality control company (SME) in the field of construction (including transport infrastructure engineering, hydraulic works, building and industrial works) born in 1972 and employing around 200 people. Its headquarters are in Malaga (Spain) but it includes 10 regional offices all around Spain and 6 international ones (Brazil, Panama, Colombia, Equador, Bolivia and Chile). The company includes the following business lines: 1) Transport Infrastructures Engineering, 2) Geotechnical Engineering, 3) Building and Industrial Engineering, 4) Construction Materials and Quality Control, 5) Health and Safety Coordination, 6) Product Certification, 7) Research, Development and Innovation (R&D). Main activities and expertise in the field of transport infrastructures includes: feasibility studies, geotechnical studies, infrastructure and facilities designs, project management, work direction, topography, material quality control, technical and environmental site supervision, testing facilities, pathology studies, maintenance assistance and health and safety coordination. The company includes a multidisciplinary team able to provide a holistic point of view in the field of transport infrastructure covering the following stages: design, quality control laboratory, site supervision and Work Direction, inspection, maintenance assistance and cost analysis. CEMOSA has always kept an interest on Research & Development. The company has a consolidated Research & Innovation department with experience in R&D projects mainly in the field of transport infrastructures, construction materials and energy efficient buildings. It was the coordinator of a project in the FP5 (SMARTCOMP) and more recently of two FP7 projects: one of them in the field of railway maintenance (ACEM-Rail), and therefore closely related to INFRALERT. The other one was in the field of energy efficient buildings (SEEDS). It also participates in the ongoing FP7 on railway technologies CAPACITY4Rail, in two other FP7 projects in the field of energy efficient buildings (BRICKER and eeEmbedded) and in one FP7 project in the field of Smartcities. The company also leads and participates in other research projects funded by the Spanish Government. Among them, the project FASTRACK (led by CEMOSA) is in the field of track infrastructure. This comprehensive expertise covering different stages of the transport infrastructure chain, from design to maintenance, together with is experience in the coordination of FP7 projects, allows the company being in charge of the technical/administrative management and supervision of the whole INFRALERT project in a daily basis. CEMOSA is an active member of the European Energy Efficient Building Association (E2BA), the European Construction Technology Platform (ECTO), the Spanish Technology Platform of Construction (PTEC) and the Spanish Technology Platform for Railways (PTFE). Role in the project: CEMOSA is the Technical Coordinator and the leader of WP1 on ‘Project Framework and Requirements’, WP5 on ‘RAMS&LCC Models and Analysis’ and WP9 on ‘Dissemination and Exploitation’. Starting from extensive experience in track measurement, over the last ten years DMA has broadened its product range. This now extends to both embarked (infrastructure inspection) and wayside (rolling stock inspection) systems. The geographical areas where DMA is active are now include Europe, North America and the Far East. DMA probably has the longest and most proven experience in the world for high-accuracy track measurement. The range of DMA instruments includes Track Geometry, Turnout and Crossings, and Rail Profile with an accuracy high enough to evaluate the wheel-rail interface dynamics, including the equivalent conicity. The interoperability of different train types, especially on new high speed lines, requires a tighter control of the track parameters. The track parameters must meet the UIC518 and UIC519 values, as the trains have been certified according to track conditions assessed in these norms. DMA has pioneered this work: DMA’s software has been used by the UIC519 commission to check the algorithms in the norm. HDL code for Laser triangulation measurement, image processing, etc. The parameters measured on the track are more than the ones required by the EN13848. DMA staff is currently composed of over 30 people, three quarters of them being engineers. The team includes engineers and mathematicians whose know-how spans the entire range of competencies needed for the development of the most up-to-date systems: electronics, software, firmware, mechanics, optics, network processing, web applications, pattern recognition, vision systems, etc. Everything is developed in house, in order to be able to guarantee product evolution and the best technical support for customers. External consultants and the cooperation with universities are useful in absorbing new technologies, which are often developed in different industries but likely to enable the development of previously unthinkable new products. Role in the project: DMA is the leader of WP2 on ‘Data Management’. Régens (REG) is an innovative system integrator and software developer company headquartered in Budapest (Hungary) with business location in London (UK). Régens has a clientele from different business sectors (manufacturing, transportation and logistics, administration, finance…). The company has strong awareness of research and innovation in the ICT field, being active both in the European (EU R&D framework programmes) and Hungarian ICT research programmes. During its 20-year long history, the company has provided a set of high-quality software products and successfully completed a row of large-scale software development, system integration and research projects. Within this project Régens will focus on the development of the expert-based IMS, the integration to existing systems and implementation of components with AI features (e.g. machine learning). Also, the company will contribute to the project with its domain knowledge in the field of road transportation. Role in the project: REG is Exploitation Manager and the leader of WP7 on ‘Development of the expert-based Infrastructure Management System (eIMS)’. The University of Seville (US) is a teaching and research public institution, comprising several Science, Technical and Social Faculties. The Transportation Engineering and Infrastructure Division is part of the Faculty of Engineering. The main objectives of this Unit include the quantitative analysis and assessment of transport systems, mobility demand, the generation and dissemination of knowledge and formation of researchers. iv) Traffic and Transport planning (urban, interurban, surface, multi-modal). The Division is composed by proficient engineers specialized in Transports with post-graduate qualifications, complemented with different backgrounds such as computer programming and statistics, who are poised to excel in the field. Role in the project: US is Dissemination Manager and the leader of WP4 on ‘Alert Management’. Luleå University of Technology (LTU) is one of the few universities in the world that currently offer training and research in operation and maintenance technology. LTU is a strategic center of excellence for the infrastructure sector, which conducts research and development with focus on streamlining operations and maintenance of the entire railway system. 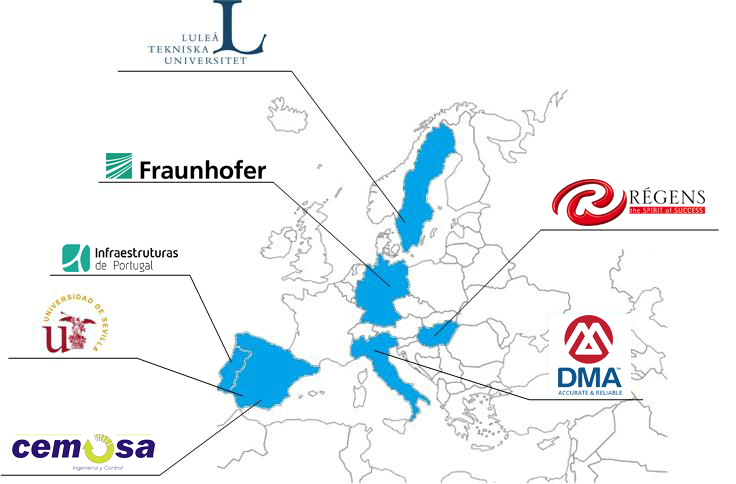 LTU provides a platform for effective interdisciplinary collaborations between universities, companies and authorities. The main purpose of LTU is to coordinate the railway research works being pursued at different Departments and Centers at the University and to facilitate the contacts between researchers and the railway sector in general. The goal is to serve as a center of excellence for creation and dissemination of a systematic body of knowledge for improvement in maintenance practices and processes for railway. Role in the project: LTU is the leader of WP3 on ‘Asset Condition’. Infraestruturas de Portugal (IP) is a public company holding a long term concession contract of the national road and rail infrastructures in Portugal, managing about 15,000 km of roads (from motorways to rural roads), over 2,500 km of railways and over 7,000 bridges. It has the mission to provide a public service in areas such as funding, maintenance, operation and development of the Portuguese Road and Rail Networks. IP is structured in different core areas providing multiple skills in the field of asset development, management and operation of road and rail networks. Regarding road asset management, IP has a unique in-house experience in the entire chain of surveying processing and use of the necessary data, especially for pavements, bridges and other engineering structures. This experience last for several years, providing valuable management data, used for long term analysis, multiannual investment assessment and also for short-term actions, whenever relevant. IP Pavement Management System and Bridge management System are two successfully developed tools. As well as all other relevant company data, both systems are centralized on a GIS platform that supports the work throughout the enterprise. Road inspections and maintenance management is coordinated by the Asset Management area, which manages the overall road and rail network quality, identifies needs of survey annual campaigns, sets up priorities and allocates fund for both routine maintenance and corrective maintenance respecting the available budgets. Role in the project: IP is the leader of WP8 on ‘Demonstration’.